A doctoral hood is a highly coveted garment in academia, so much so that one student was willing to travel nearly 5,000 miles to obtain the hood she had worked toward for years. Kosovo-native Albina Balidemaj’s visit to Clemson in May to attend her doctoral hooding ceremony also happened to be the first time she ever set foot on campus. This was not Balidemaj’s first trip to the United States. Her family came to the U.S. in 1999 as refugees fleeing the armed conflict between the Federal Republic of Yugoslavia and the Kosovo Liberation Army. Balidemaj attended the University of Minnesota Twin Cities to earn an undergraduate degree in clinical psychology. She returned to Kosovo in 2006 with the World Health Organization (WHO) to work with cognitively challenged children from the Roma community and ended up staying in her home country. Balidemaj was attracted to the Ph.D. program in International Family and Community Studies at Clemson because of the program’s partnership in Albania with Marin Barleti University. After looking into the program online, Balidemaj met with Jim McDonell, director of the Institute on Family and Neighborhood Life. The program, its faculty and the tools it would afford her were reason enough for Balidemaj to pursue her doctorate through the program’s distance-learning blended format. 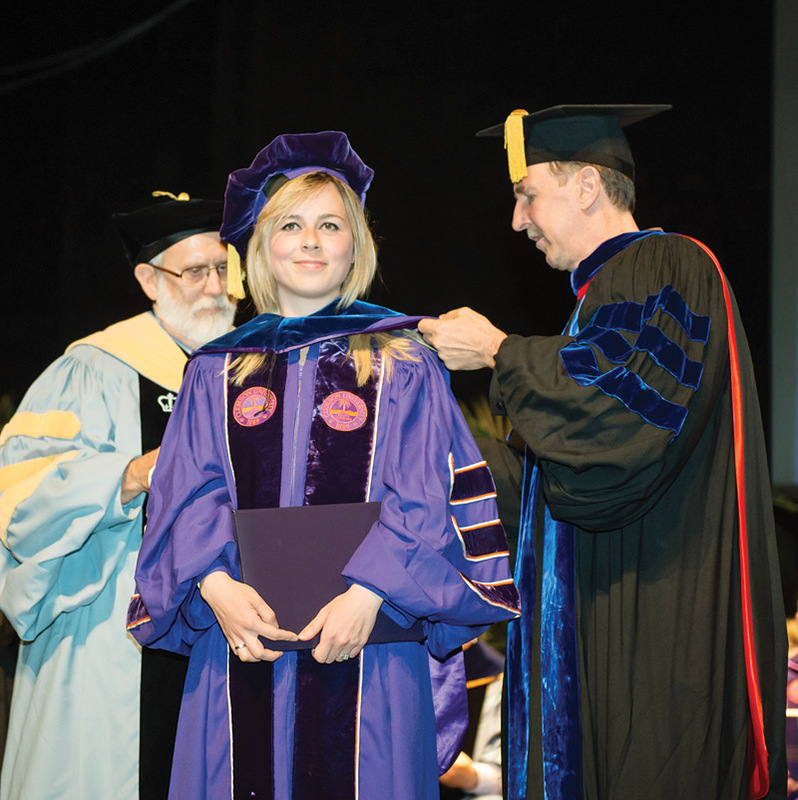 Balidemaj’s doctoral hooding represents not only Clemson’s first doctoral degree to a student from Kosovo, but also the program’s first graduate to have a university appointment there. Balidemaj’s dissertation was titled “Acculturation, ethnic identity and psychological well-being of Albanian-Americans in the United States,” and as such became a highly personal research experience for her. She explored how well refugees between the ages of 25 and 35 adapted to a new culture. Mark Small, director of the graduate program at the Institute on Family and Neighborhood Life, was Balidemaj’s major professor during her time in the program. He said Balidemaj, like other students who participated in the program from outside of the U.S., helped to enrich the experience for all students in the program by providing a first-hand account from a country undergoing democratic change.